I think knitting has always been a social activity. I picture Laura Ingalls knitting within her family circle. Whiling away the winter hours and listening to a book read aloud. I picture her putting her needles away in the harvest seasons and pulling them out to enjoy a little winter down time (while trying not to freeze and making sure the stores in the basement will last until spring). 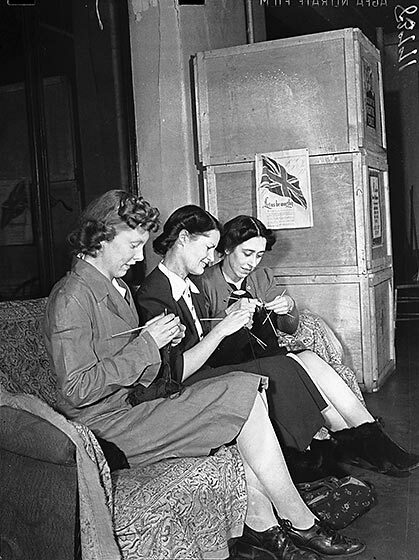 Knitting has not been relegated solely to the home of course, women would gather to knit socks for soldiers, hats for babies, and sweaters for their families among other things of course. When I think of my own knitting I definitely think of it as a more social activity. I knit with people a lot of the time, and discuss knitting even more often than that. There is also an abundant online knitting community. Even if I’m all alone with my laptop there are still thousands of knitters I can connect with on Ravelry and blogs. It really is a social activity! One of the ways knitting is social is the KAL. We all knit from the same designer or even the same pattern and the results are all different. This is definitely a topic of discussion among the social circle at Knit Night. The time has come for another KAL party! Bring your FO’s (that’s finished objects) and your photo face to Urban Yarns tomorrow at 7 and be social. This entry was posted on Thursday, September 27th, 2012 at 10:39 pm	and is filed under Uncategorized. You can follow any responses to this entry through the RSS 2.0 feed. Both comments and pings are currently closed.